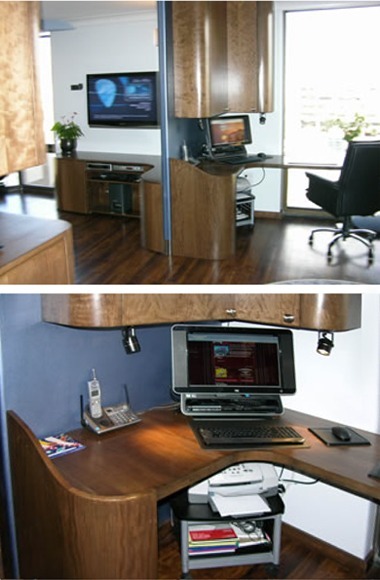 A Home Office Murphy Bed offers an elegant and creative way to maximize your home office space. A SICO EuroBed Queen bed system partially lowering a 13” thick mattress. Solid Cherry mitered framed raised panel doors. 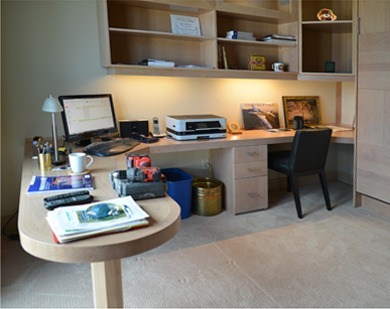 A real Queen Mattress hidden in this practical home office. The upper storage cabinet features corner display niches for favorite tokens of Tom’s business travel to South America. An LED light system is hidden behind the valance. 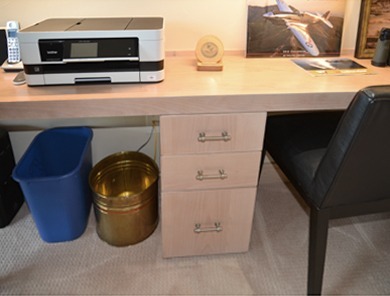 Its dimmer control expands the work surface for the printer and photographs of family. 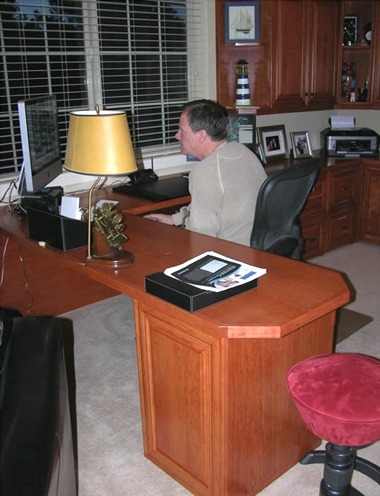 The wide keyboard drawer has a special deck for the lap top. 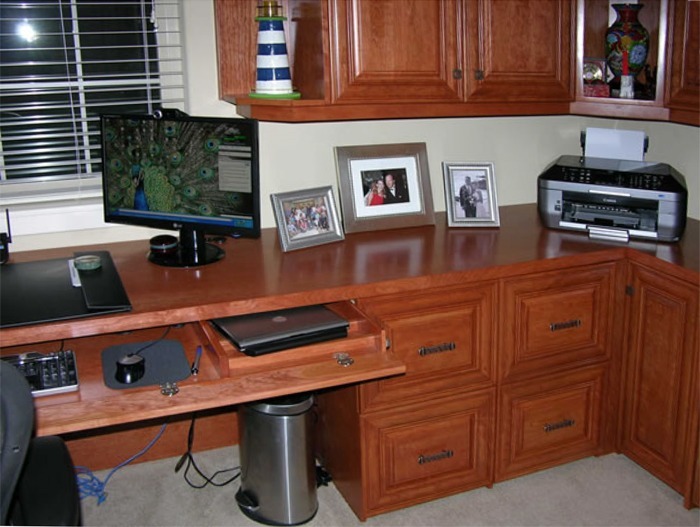 Add a peninsula desk with 3-drawer pedestal. 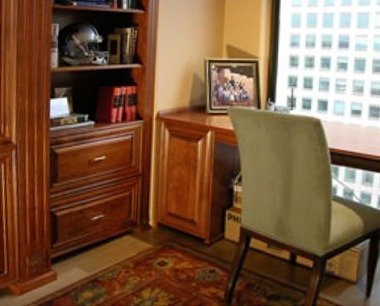 The desk extends over the drawer pedestal to welcome a visitor to Tom’s Office. 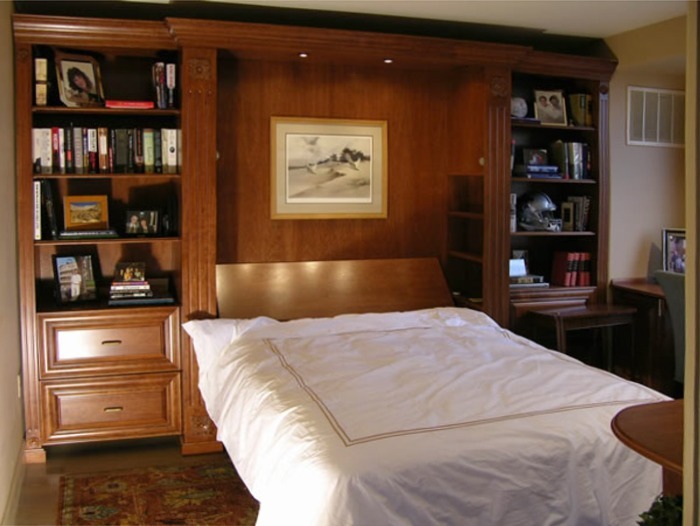 Here’s a quick video tour of Tom’s Home Office Murphy Bed. Three-Wall Cherry Wrap – 20 Floors Up! 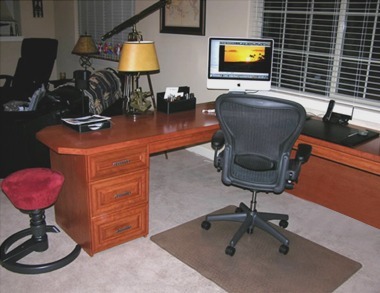 Brenda had one agreement with her husband… his side of the guest room had to be an office. She could have her guest bed on the other side of the room. This is the design a Chicago designer helped Brenda tell us how to make. 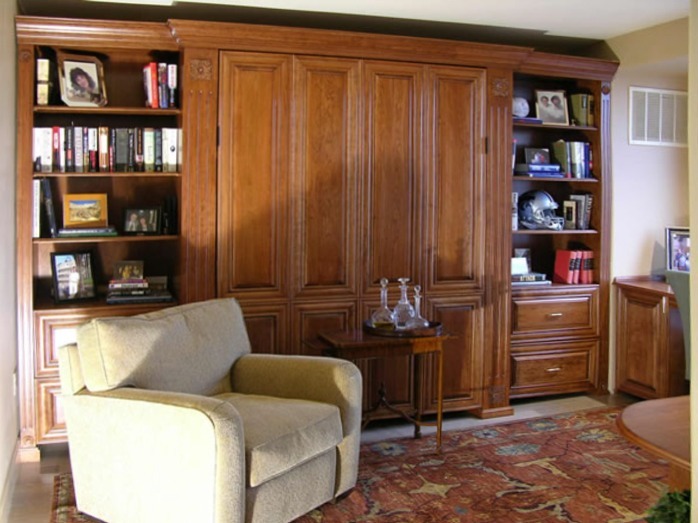 The raised panels are solid Cherry framed and accented by mitered corners. Very elegant! The view is looking east into Denver along the 16th Street Mall from the 20th floor. Interior lighting accents the artwork and our exclusive sloped headboard. This headboard is designed to fold automatically closed as the bed is lifted by fingertip. 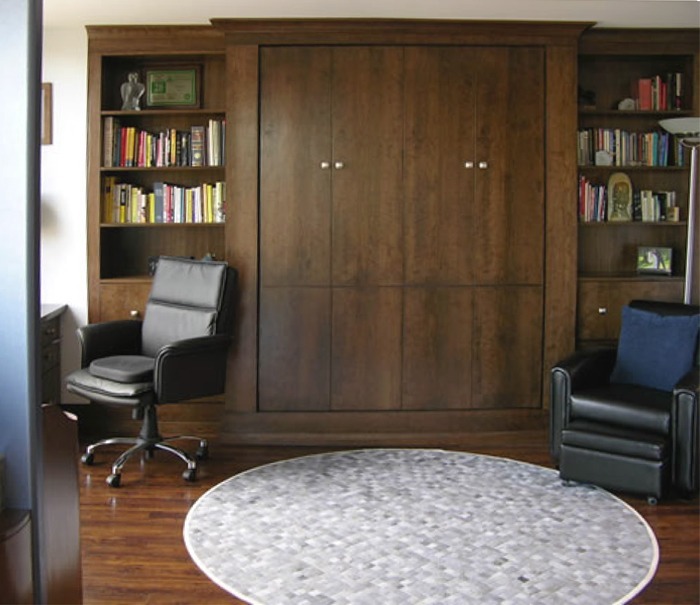 Anyone can easily operate this Home Office Murphy Bed. 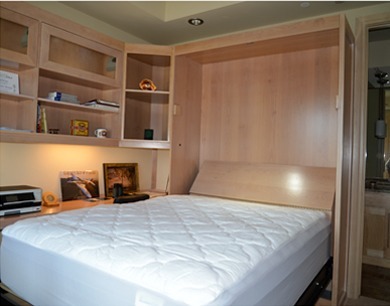 The SICO Eurobed mechanism and frame could easily lift the solid Cherry panels and 14″ thick pillowtop mattress. 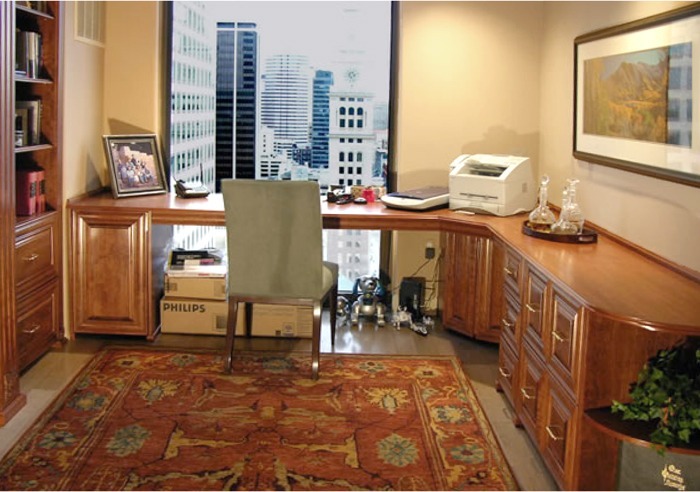 Billi Lee wanted a home office in her Downtown Denver condo. And, because there were frequent guests connected to her fame as an international speaker, (www.billilee.com) she didn’t want to give up the convenience of a guest room. So, we stored the 14” thick mattress behind a façade of door panels. 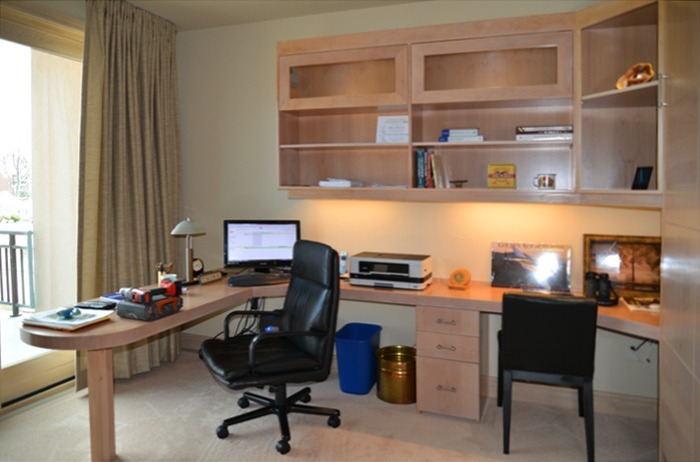 Interior shelf system allowed a nightstand function for the guest, without infringing on the office theme when bed was closed. 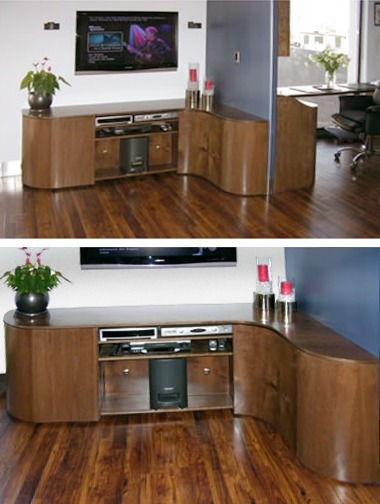 This system is select Cherry veneers and Cherry solids. The finish is custom to reflect a sample given our finish room. The goal was to mute the natural red tones in cherry and accent a brown hue. 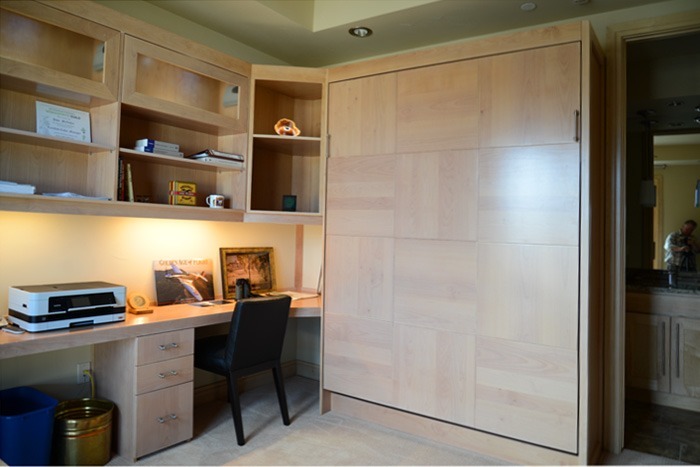 This is a one-of-a-kind Home Office Murphy Bed that seamlessly fits into the style of the home. Billi asked if we couldn’t do a small desk and entertainment center also. The pictures here show that we manufactured some unique pieces of furniture. 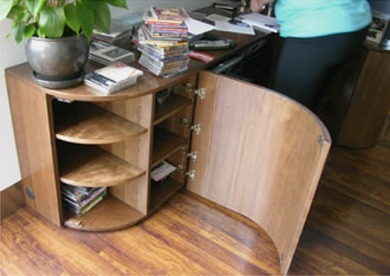 This was our first manufacture of curved doors! If you are a manufacturer… here is a suggestion: Make the doors first! Then make the cabinet! 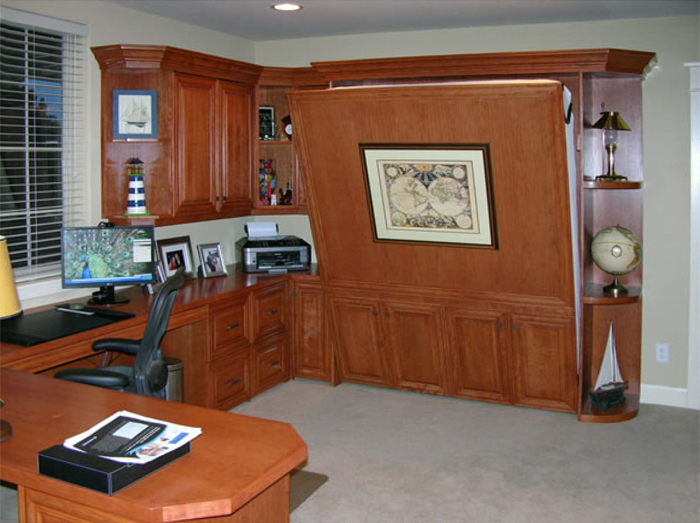 Some very unique manufacturing techniques went into this Queen Size Home Office Murphy Bed in Colorado Springs. The wood for this FlyingBed is Maple with a glazed white wash lacquer. The inlet for ‘return air’ was behind the closed bed. We elevated the bed and put a valance board below the bedface panel that allowed air to ‘bump’ up and over that surface and still reach the inlet grill. The mattress is from Old West Mattress company. It is a coil and memory gel combination that is 14” thick. Comfort to the max! Aviation art will be hung inside the lowered bed. The owner flies his plane to offices in Southern Colorado each week (nice tie in to FlyingBeds). 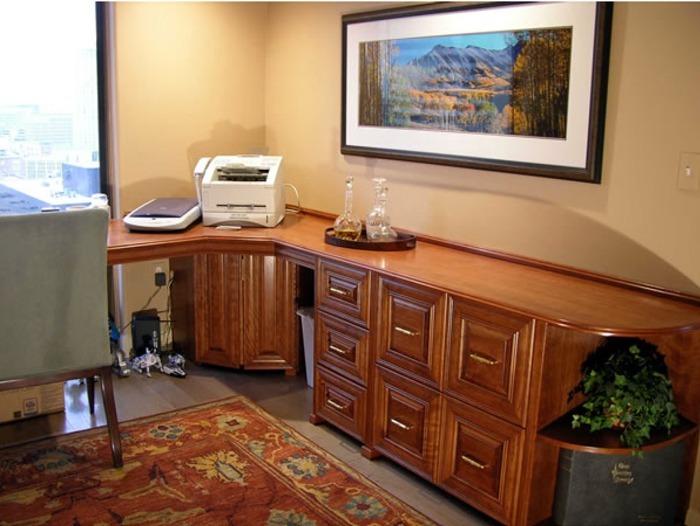 When the room is large enough, we love to manufacture the Peninsula Desk option. The owner opted for this work surface instead of a Bed Face Table.